I have been thinking about writing this for a long time. I feel like my reading taste and the way I rate books has changed so much over time, and the ratings I give to books depends so much on my mood, that sometimes I feel bad when I rate them. I feel bad because sometimes books I like so much more than others end up with the same rating or with a lower rating, because I read them at different points of my life or because I read one of them when I was in a reading slump and the other when I was not, or because I rate genres differently. It’s just that there are so many things that affect the rating of a book that have nothing to do with the book, and sometimes I feel like I’m being unfair. I feel like I’m more critical when I rate books now, than, let’s say, when I started to rate books on Goodreads. Being older has come with changes in the way I see the world, the things I consider important, I have also had time to read more and learn what I like and what I don’t. The change in the ratings has to do with a lot of things, and sometimes I feel like it’s not fair to some books. This situation has got to the point were I have been tempted to go back and change the rating I gave a book I read years ago. The thing is I think that’s not fair either, because even if now my reading taste has change or I have read more and I can see that maybe that book wasn’t as good as I though it was back when I first rated it, I think it’s not fair to the book that I change the rating after years, when I don’t even remember the book so well, and I don’t remember how I felt when I read it or what I thought when I read it. Also, I feel like sometimes I ask more of some genres and I go easy on some others. Fantasy is my favorite genre, and I have read some amazing fantasy books and I even have some categories that I rate when I’m read this genre. Sometimes, I’m really harsh with some fantasy book, simply because I have read great fantasy! On the other hand, I read YA contemporary and new adult, and I rate them mostly based on the level of entreteinment they provided. Sometimes, fantasy books that I liked more than some contemporary or new adult book, get the same rating. For example, I read Falling Kingdoms by Morgan Rhodes and I gave it a 3 or a 3,5 stars. I felt like it wasn’t as good and I had a lot of little problems with it. Nonetheless, I still feel like I liked it more and it gave me more than a lot of the new adult books I have read and that have the exact same rating. Nonetheless, I also know that books from one genre and from the other are trying to accomplish different things, and that’s why sometimes I’m more critical with some book than others. The thing is, in the example of Falling Kingdoms, I didn’t rate the book only thinking about the genre it belong to. When I read the book, I was in the middle of a reading slump, so that affected the way I felt towards the books and it affected the rating it got. And that’s my last point, there are other factors, like mood and life situations, that affect the way I rate books and there’s not really anything I can do about that. Sometimes I use reading as an escape and I read when I’m in a bad place with my family or with school, and that affects the rating the book gets, but I’m not gonna stop reading because of that. And this can go both ways, sometimes my life isn’t in a good place, and a book helps through that and it makes me feel better, so it gets a higher rating. That’s why sometimes I feel bad rating books. After thinking about it, I feel like I need to rate books based on what they intended to do (entertain, make you think, confront you with something, make you believe in the impossible), and that includes rating books according to the genre they belong to (because the authors have to do different things depending on what genre they are writing). 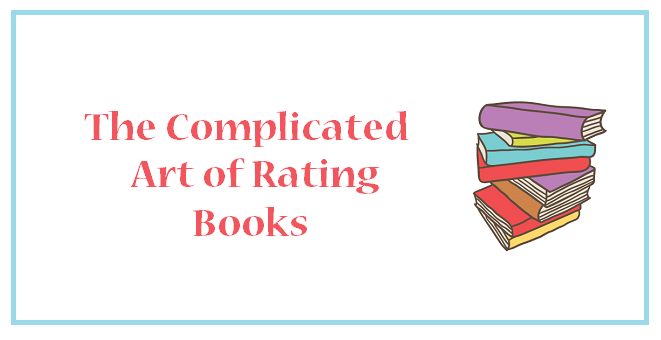 I have not found a definitive solution to this problems I found while rating books. Nonetheless, what I have been doing lately is trying to give books more especific ratings, not only giving 3/ 3.5/4, but also 3.7 /4.2/4.7. It just something I’m doing to try and say more with my rating, and it actually has help me calm my anxiety over this issue. I don’t if it would work for anyone else, but for me it has help a little. ‹ PreviousTotally Should’ve Book Tag! This is such an interesting discussion post though, I never thought much about how I rate books O_O. Thought provokingggggggg. Have a great day :)! I think it's so amazing that you're going to the extra effort to break down your ratings even more than half stars. I am strictly a whole star person because any more than that would drive me crazy. Especially considering I have habit of comparing book ratings. Like, I look at this book and I like it more than the others that are two stars but less than the ones that are three stars. A situation like this would make the half stars come in handy, but I hate comparing books and feel it's not something that I personally should be doing.